Dominique Strauss-Kahn, head of the IMF, wants a Marshall Plan to help rebuild Haiti. Amanpour: Christiane's live from Haiti at 2 p.m. ET Sunday with the latest on how the world is coming together to provide support for Haiti. Port-au-Prince, Haiti (CNN) -- Haitians have to be in the driver's seat as they try to rebuild their shattered country after last week's devastating earthquake, the head of the International Monetary Fund told CNN Friday. 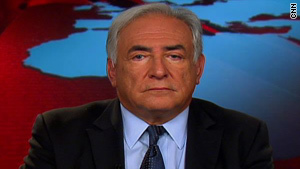 "We can provide resources, but there must be ownership by the Haitians themselves and especially by the Haitian authorities," Dominique Strauss-Kahn said during an exclusive interview with CNN's Christiane Amanpour. Repeating his call for some kind of Marshall Plan like the one that rebuilt Western Europe after World War II, Strauss-Kahn said, "We need to have the entire international community working together -- I call it a Marshall Plan." His comments came three days before an international donors' conference in Montreal, Canada, that will raise money for Haiti and look at long-term prospects for recovery. "I hope that the decision can be made not only to help for the immediate needs, but to help for the long term, and rebuild the Haitian economy," Strauss-Kahn said. "We cannot just deal with some piecemeal thing, saying we're going to provide some resources here, some other resources here," he added. "It has to be a comprehensive plan, and I think that the Haitian authorities agree with this view." Jeffrey Sachs, a special adviser to the U.N. secretary-general and head of Columbia University's Earth Institute, strongly supported Strauss-Kahn's view. Sachs said Haiti needs a sustained international effort coordinated not by the U.S. government but by an organization such as the Inter-American Development Bank. "I would not subcontract to a lot of businesses the way we've done in Afghanistan and Iraq," he said, "because we'll never see the money again." A journalist who has spent decades covering Haiti , Mark Danner, expressed concern about the way the international aid effort may be handled. "We should be a bit skeptical about the history of development and development organizations in Haiti," he said. "If this rebuilding is going to be successful, it has to be done by Haitians. It has to put money in the hands of Haitians and not just the Haitian elite." The question, Danner said, "is how you free the people from the grip of what has been, at least historically, quite a debilitating government and unleash the entrepreneurial energies of the people of Haiti." One of Haiti's most acclaimed novelists and poets, Lyonel Trouillot, agreed. He said Haiti is not a failed state or a failed country. "We need money. We need technology. We need support. But what we most need is to remain the ones who decide our own future," he said. "It is time for us to come together and improve, stop thinking about only the few rich and think about the whole country," he added. Sachs said it is vital not to waste any time rebuilding. "We shouldn't see this as people going into tent cities and then living there as displaced populations for months or years. That would be a disaster and tragedy," he said. "We need to start on the recovery and development effort within weeks."